Uncheck any Location that you want to totally exclude from monitoring. As you uncheck Locations, the Devices will be removed from the Devices panel. 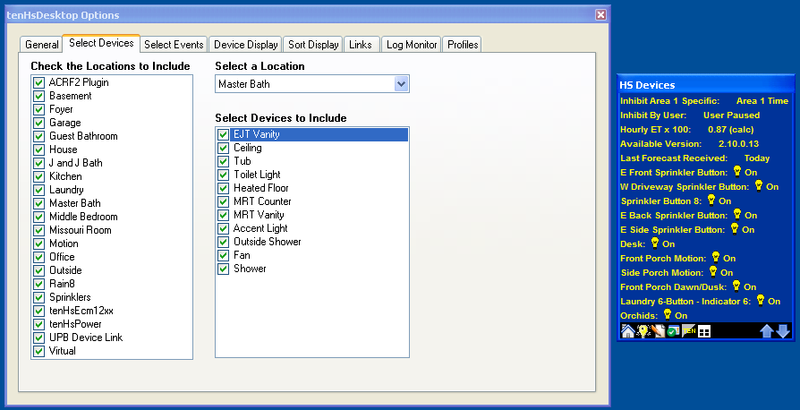 Now select each Location one at a time from the drop-down list, displaying all of the Devices in that Location. Uncheck the Devices you do not want to monitor. As you uncheck Devices, they will be removed from the Devices panel. Browse to the Select Events page to configure which HomeSeer Events can be triggered by tenHsDesktop.